The Driving Arenas feature a set-in design that is user friendly for set up. The rails are pre-measured so you simply place the rail into the supports which assures perfect increments every time. The supports are made with white UV stabilized polyethylene. The 100% UV treated material is super tough and durable and will withstand abuse and all-weather conditions. The Wellington Arenas are very stable in high wind areas. We use ribbed rails (not hollow) that are made of 100% UV resistant PVC. Ribbed rails add strength, durability and rigidity. 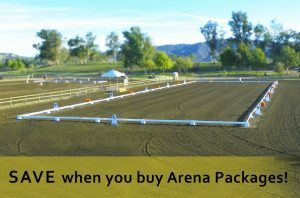 The Wellington Arena uses 1 1/2in. x 5 1/2in. rails that make the height the required 12in.